Home Blog General Why Do Dogs Have Seizures While Sleeping? Why Do Dogs Have Seizures While Sleeping? You’ve seen it before – the whimpering, the legs thrusting forward as if your dog is chasing a rabbit through a field in his own dreamscape. It’s comforting to imagine your dog bounding, unleashed through a meadow and enjoying himself. But as many pet owners know, sometimes those cute leg thrusts and seemingly innocent yelps aren’t just a dream – or even a nightmare. In some cases, your dog may be suffering from a seizure. Epilepsy is relatively common in dogs – but is not the only driver of canine seizure episodes. Congenital blood defects, kidney and liver disorders, brain tumors and even certain medications can spur a seizure. Pinning down the reasons for seizures can be difficult – especially when they happen during sleep. But why do dogs have seizures while sleeping? The reasons for seizures being triggered in dogs at a certain point of time is unknown, but seizures most often happen when a dog is sleeping. Seizures happen when brain neurons misfire, causing the dog to shake or jerk uncontrollably. 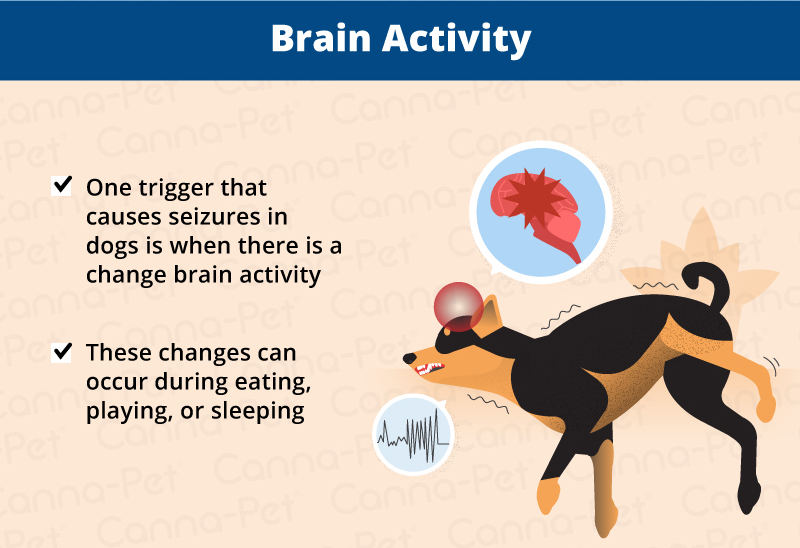 A triggering reason for this could be that seizures often happen during times of changing brain activity – excitement, feeding, sleeping – which can trip up the dog’s brain circuits and cause a seizure. Think of a car driving down the freeway at 60 MPH, then exiting to a ramp. The speed and direction of the car changes in an instant, shifting to a slower, more methodical driving atmosphere for drivers. Some drivers instinctively turn down their radios when exiting the freeway to “readjust” to their new atmosphere. Sleeping dogs experience the same thing – one minute, they are up and waiting for a treat, the next, they’re diving into a dream world. The transition can cause the wrong neurons to fire, sending the dog into seizure. Seizures in epileptic dogs are often more common, and more severe, in young dogs. Dogs retain puppy behaviors until around age 2. They’re often more curious, more distracted, more energetic – and sleepier. Puppies tend to run their bodies and their brains ragged before falling asleep on the spot. It’s an adorable trait, but may also be a reason so many young dogs suffer from seizures while they’re sleeping. The simply tend to do more sleeping than older dogs – and their brains are not yet fully developed and able to navigate the internal changes they experience daily. Epilepsy isn’t the only cause of seizures in dogs. Low blood sugar, ingestion of poisonous substances, and blood pressure issues are common causes as well. These causes can take time to reveal themselves – often during sleep. Smaller dogs are prone to seizures that happen due to blood sugar and blood pressure. Smaller bodies often result in quicker metabolism, and a stronger likelihood that a dog will suffer a seizure during long periods of sleep during which the body digests foods and foreign substances that can trigger seizures. These issues affect all dogs, but our more diminutive furry friends can have stronger reactions to seemingly minor bodily disruptions. For the reasons above and more, nighttime – between the hours of midnight to 5:00 a.m. – is by far the most common time for dog seizures. Forcefully changing a dog’s sleeping pattern likely won’t help – it will only make your dog tired and antsy. The best thing you can do for your dog is learn what it looks like when your dog is having a seizure, monitor when the seizures are taking place, how often they are happening, and whether your dog exhibits any behavioral traits prior to having a seizure. Gathering this information will be extremely helpful to your dog’s veterinary care provider in determining the root cause of your dog’s seizures. Don’t panic. Seizures are relatively common in dogs, especially at night. Most seizures aren’t life-threatening. In fact, many dog owners remark that their dogs seem entirely unfazed after a seizure. 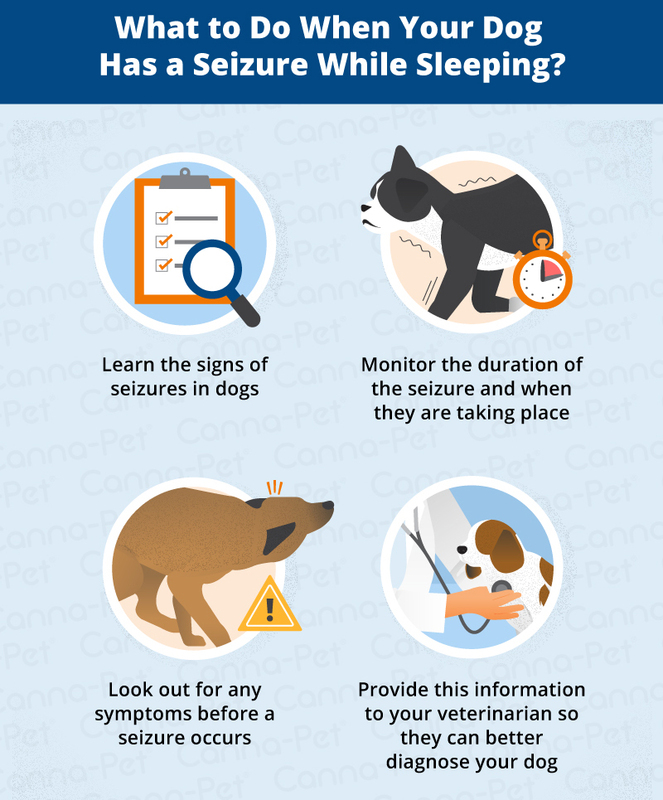 Just make sure to stay on top of it – and make sure to visit your vet to learn about what to do if your dog is having a seizure, how you can mitigate the causes of seizures, and how you can help your dog live a comfortable life. They may suggest pharmaceutical or natural treatments for your dog, or even a combination of remedies. It may take time to find the perfect blend of treatments, so make sure to learn how your dog responds to treatment. “Is My Dog Dreaming Or Having A Seizure?” Petwave, 27 Oct. 2016, Accessed 10 March 2017. www.petwave.com/Dogs/Basics/Dream-or-Siezure.aspx. Klein, Jerry. “​Let Sleeping Dogs Lie: Seizures and Dreams.” American Kennel Club, 16 Mar. 2017, Accessed 10 March 2017. www.akc.org/expert-advice/health/dreaming-vs-seizures-in-dogs/. “Seizures and Convulsions in Dogs.” PetMD, Accessed 10 March 2017. www.petmd.com/dog/conditions/neurological/c_dg_seizures_convulsions. Malone, Maureen. “Dogs and Seizures in Their Sleep.” Animals – Mom.me, 26 Sept. 2017, Accessed 10 March 2017. www.animals.mom.me/dogs-and-seizures-in-their-sleep-12286807.html. “Epilepsy in Dogs.” The Kennel Club, Accessed 10 March 2017. www.thekennelclub.org.uk/health/for-owners/epilepsy/.